Steve, a tidy and carefully spoken man wearing an immaculate suit and a white goatee, whose love for human perception crystallized while studying psychology and modern British philosophy at U of M, explained to me the uses for his anechoic chamber, as well as his thoroughly echoic reverberation chambers. I regret that my familiarity with science is limited to what I’ve learned from comic books, so I can only relate the rooms’ purposes to you in the most layman of terms: They are to measure the sounds that equipment makes. You wouldn’t want your heart surgeon maddened by the intrusive beeping of your life support machine, and you wouldn’t want your fridge to shoot cannon balls through your circadian rhythm by humming loudly all night. The companies that make these things don’t want that either, so they are glad to have a man like Steve on hand. Our first stop on the tour was the studio auditorium, kept mostly the same since the days when Orfield Laboratories purchased the building from Sound 80 Studios in 1990. It was there where Bob Dylan recorded Blood on the Tracks in 1974, and Prince and Cat Stevens graced the place too in its heyday. The little recording room, set aside by glass walls, had an old beat to hell couch from which some producers must have happily watched things unfold. The studio also housed three recording torsos, mannequins with blank matter of fact expressions and perfectly formed rubber ears. These are used to record sound exactly as a person would perceive it, and would make exceptional Halloween decorations as well if they did not cost $30 thousand apiece. Second on the itinerary was a reverberation chamber, a stark white concrete block affair with gently curved metal plates, called diffusers, dangling from its ceiling. It would make a fine setting for an avant-garde Yoko Ono music video, as if there’s any other kind. Everything about this space is meant to make sounds echo as well as possible. One shrill whistle from my lips hung around us for a solid four seconds, although Steve explained that it would have gone for four and a half had our meaty bodies not been present to soak some of it up. Next we went to the anechoic chamber, a thoroughly opposite experience. The walls and ceiling of the chamber are lined with what look like formidable wedges of cheddar cheese, alternately oriented vertically or horizontally. The floor is a metal mesh, over which some very scientific sheets of plywood are laid, which do well to keep the space from feeling rather like an abattoir. Steve shut the door after we stepped inside, and the silence began to roar. I stood there in the center of the room, listening for some defect in its design but unable to find one. I soon became aware of how noisy my own body is — a cacophony of joint creaks, heartbeats, and borborygmi. Steve interrupted the silence to tell me how the chamber works, its room within a room within a room design, how the wedges all around us soaked up even the most inaudible peeps, how the strange feeling seeping into my sinuses was caused by the absolute absence of pressure against my ear drums. His voice sounded like it was coming from the speaker of a Casio wristwatch, or a mouse. 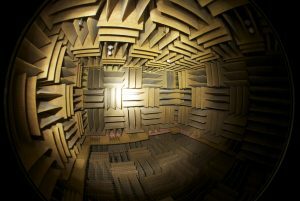 I’d not like to be trapped in an anechoic chamber. Indeed, Steve explained as we exited, the room’s technology owes some its invention to old research into making enemy spies as uncomfortable as possible once caught. I enjoyed elevated levels of hearing as we returned to the lobby, and guessed at what the first class passengers in the plane that whirred over us were having for lunch. Steve showed me the awards that he has won, the books that have been written about his operation, and the records that had been recorded there. I thanked him for his time, and apologized in advance for being only able to explain the beautiful science he had shown me in the basest, most personal terms in this article. “There’s no better way to get people interested in science than to be personal about it,” he consoled me. If you would like to visit Orfield Laboratories, and even experience the quietest room in the world yourself, you can learn all about the place and the tours offered there by writing to info@orfieldlabs.com.